The past couple of weeks have been absolutely crazy for me, particularly working some long hours in preparation for big meetings this week. Last week was beyond stressful, but I had a few awesome things happen...which I will get to later this week. 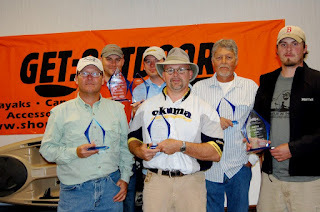 And even as things got really stressful, there was a light at the end of the tunnel - the North Carolina Kayak Fishing Association Battle in the Boro 2012. This is an event that has been tough for me in the past. Two years ago, I managed only one bite, which was good enough for 5th place. Last year, I caught some decent fish, but got my heart broken by a giant that spit my hook. This year, I was looking for some redemption...and I got it. In previous years, the event was a little different. There were two divisions - one for conventional gear and one for fly gear. While the conventional division was bass only, the fly division was any species. So, after seeing a ton of carp last year, I decided I was going to do the fly division this year and target carp. But, when the rules came out for this year, the fly division was also bass only. I debated for a while about exactly what I wanted to do and after talking with Mary May and Bill, I decided to go for the fly division. I told Mary May I was worried because I was rusty - having not fly fished for bass in roughly a year. But, she gave me one of those looks and I knew she had confidence in me. That meant a lot and really had me feeling good going into the event. I consider myself to be a good fly fisherman, but not nearly as good as a lot of my friends and fellow fly fishers. I knew it would be a good challenge for me and I was excited to see how it turned out. The day before the event I was headed to Bass Pro Shops in Charlotte to pick up my new kayaks. While there, I swung into the fly fishing section to look for a couple specific flies. I didn't find exactly what I wanted, but one fly really caught my eye. It was a surface fly with a big body and appendages. But, the key trait was that it dove slightly when popped and that allowed me to really mix up my retrieves and give some different looks. So I started the day with it tied on my 8 weight rod and a fly tied by my good friend Levi Blazer (one of the guys I mentioned above who is a super talented fly fisherman) on my 6 weight rod. 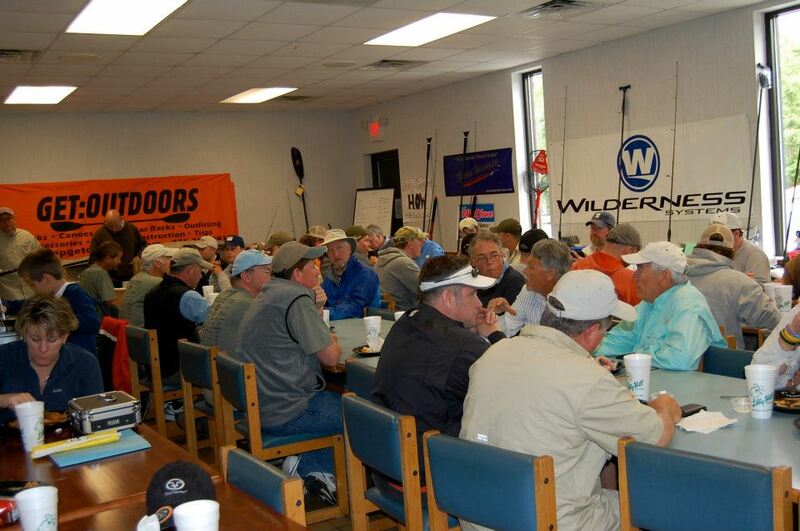 The Battle for the Boro is named such because participants can fish on any of 8 city lakes in and around Greensboro, NC. I decided to fish Randleman Lake, where I had found some success last year. I launched amid some 40 bass boats and made the paddle across the lake. The air temperature was around 50 degrees with a high of 55. The wind blew hard at times, ranging from 5-20 MPH. My new Malibu Kayaks Stealth 12 flew across the water and I pulled into the area where I planned on starting. But, it looked a lot different than last year. Two large pieces of brush had been removed and the portion of the bank that had weeds previously had very little this year. On top of that, carp were splashing and going nuts everywhere. But, I didn't really have a back-up plan, so I started casting. On about my fifth cast I threw out the bass bug and looked down to adjust my drag and pull out more line for my next cast. No sooner did I look down then a small bass came up and smacked the fly. I was very late on the hook set and the fish went free. I was hoping it was a sign of things to come, but knew fish that size were not going to help me. I fished down the entire bank with no bites until finally getting to a small rock pile in about 10 inches of water. I threw my bug between the brushy shoreline and rock pile and it got nailed by what looked to be a 12-13 inch fish. But he too unbuttoned after about 5 seconds. I was wondering if the weed guard, which was fairly large on the large fly, was prohibiting hook ups. I got out my hook sharpener, sharpened the hook, and went back to casting. At this point, I was standing in the Stealth and making long casts, despite the wind. Every once in a while the "rust" showed and I made a really sloppy cast, but overall I was feeling good. About a half hour later I came into a small cover with a tree that was growing about 6 feet from the bank. The wind was blasting me at this point and I somehow managed to throw a cast right up against the tree. As I popped my bass bug by the trunk, a bass came up and absolutely smoked the fly. He ran around the tree, through a pile of sticks, over another branch, and finally into open water. Thank goodness I re-tied my leaders the night before! I landed the bass at a solid 15.5 inches and the fly was inhaled at the very back of his throat. Although it made me feel a little better, I was not confident that fish would be in the top-3 with the talented field of anglers out there. As much as I wanted to upgrade, I didn't think it was in the cards. For the next 3 hours, I didn't get a sniff. The bite totally shut off and I wasn't sure what to do. I began to ponder my strategy. 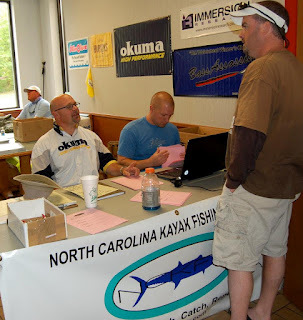 In NCKFA events, if there is a tie in length, then the tie-breaker goes to the person who checks-in their fish first. Check in began at 2:30 PM and went until 4 PM. I decided that if I wasn't having much like by 1:30, I would head in and make the drive back to Greensboro and check in my fish right at 2:30. I started working an area that looked great, but produced zero fish last year. It was also an area I noticed that bass boats, many fishing local tournaments, were avoiding. Typically, this means it is one of those anomolous areas that looks great, but holds no fish. However, with no other plan, I decided to try it anyway. While casting toward some wood cover I had a fish flash at the bait. It was a smaller fish, but it gave me an idea of a similar area I had seen while paddling earlier, so I headed in that direction. This area had a lot of brush and wood and I started casting. Typically brush and wood equal fish, but this area wasn't stereotypical bass habitat. After about a dozen casts with no luck, I finally decided to throw right into the heart of the cover. After two twitches, a nice bass that appeared to be in the 15"-17" range shot out and swiped at the fly. Unfortunately, he never got the hook and I lost yet another bass. At this point, my frustration had turned into a smile, because at least I was having fun watching bass come up and smack my fly. I fished about another 40 yards of shoreline with no bites until I again came to the biggest, thickest part of the cover on the bank. I bounced the fly off the log - landing it right at the base. Two pops later and a chunky fish came up and grabbed it. He dove deep and was hooked momentarily, but again, the fish didn't get the hook. This fish looked like he was in the 3 lb range and would have been an upgrade for sure. It was nearing 1:30 and I was beginning to weigh my options. I paddled through one last stretch of shoreline making long casts near any cover I could find. Finally, while in about a foot of water, I threw my fly near some stick-ups and started twitching it. As soon as it moved, a huge swirl engulfed the bait and the fish took off toward deeper water. This was happening as a bass boat was pulling up to the same general area and they stopped to watch the chaos. The fish was pulling every trick in the book - changing directions, running around brush, and jumping like crazy. I thought for sure I would lose her. She wrapped my leader around one last piece of wood as I maneuvered the yak to try and land her. I decided it was now or never and swung her in the boat. She was a chunky 3.5+ lb bass and a definite upgrade. I let out a big sigh of relief and gave a little fist pump. I knew all the people that support me in this sport must have had my back on that one. She was 17.75" - a whisker shy of 18". After snapping a few photos, I let her go. Shortly after I talked with the bass boat in the area and they said they wished they had a few like that. They were in a local tournament and had only managed two small keepers all day. My biggest fish of the day...what a thrill on the fly! I turned the yak and headed for the dock to check my fish in. It was hard to leave after getting a few bites in the last 30 minutes of my day, but I knew I had to go with strategy and check-in early. Bill, who had fished Reidsville Lake, showed up to the check-in about a minute after I did - around 2:10 PM. He had caught a few fish, with the biggest going 18.25", on crankbaits and topwater. There were two guys who were already there to check-in their fish and a few guys showed up just after us, including Malibu Pro-Staffer Nathan Wiles and his son. Nathan hooked two fish, but had both break his line before he could get them to the boat. As competitors rolled in, we made small talk with other anglers, planned some of our upcoming fishing trip, and waited for 4 PM to get there. Most anglers reported tough days and all the fly anglers I spoke with reported very tough days with most not landing any bass. Finally, registration closed, and we all chowed down on some food. I knew I had a good fish, but I was nervous and the butterflies made it tough to eat. They called me up to download my pictures and at this point, my blood was really pumping. 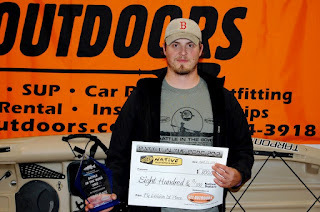 They announced 3rd place in the fly division - Bobby Dobbins from Virginia. He caught a nice 14.5" bass early in the morning on a popper. 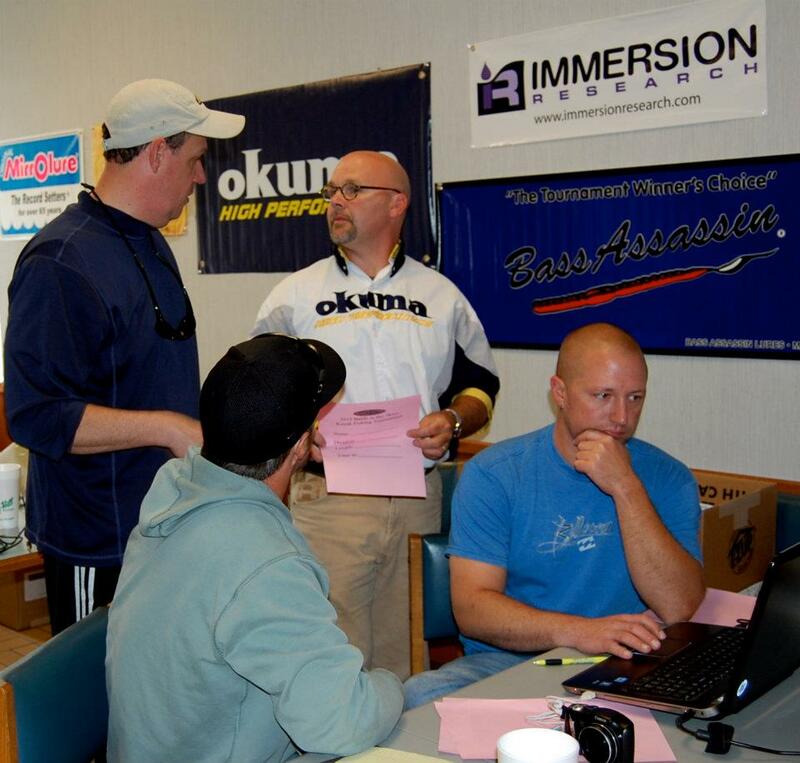 After a few raffles, second place was announced - NCKFA headman Mark Patterson had a 14.75" bass. Finally, I let out a sigh of happiness and I am sure my face turned red - as it often does. After a few more raffles, my fish was officially good enough for first place in the fly division and brought home a sweet trophy, a very nice gift certificate for a Native kayak, and an awesome piece of bass art from Jeff Christian. I was so excited and ready to come home and share the news with Mary May and my family. Talking with them on the drive back to Hillsborough helped fight off the exhaustion that comes from a long day on the water (and a long work week). I really appreciate all of your love and support! I promise I was much more excited than this picture made it look. I think there were about 65 anglers who came out to fish and support Heroes on the Water. I don't have the official numbers, but I think about 25-30 of them were in the fly division and and the remaining were in the traditional division. Bill came in 5th place in the traditional division, which is an impressive finish in that field of anglers. The winning length was 20" for that division. A huge thanks to NCKFA, Mark Patterson, everyone at Get:Outdoors, all the sponsors, and everyone else who made this an awesome event! Again, it really is all about supporting a great cause like H.O.W. My sweet new art and trophy! Now it is time to get back to work and also put the finishing touches on our fishing trip next month. I will have a couple blogs popping up later this week, so keep an eye out. Until then, tight lines! Congrats Drew! It sounds a lot like my last tourney experience, but you found a way to push through! Im hoping I can follow your lead and redeem myself at my next tournament stop! Awesome write up and awesome performance!!! Thanks guys! Evan, I have a feeling you will bounce back in the next event. Tight lines!